Animations and transitions in PowerPoint documents can add a powerful dimension to any presentation. They can also be overused and abused by inexperienced users. The following examples offer insight on my approach to adding motion to presentations. Marathas Barrow Weatherhead Lent, LLP is a Boston-based firm specializing in a wide range of employment law. This presenation sample is a truncated version of one of their talks on the Affordable Care Act. Please note the subtle spotlight animation on the title slide. This loop plays before the presenation begins as the audience is assembling. It takes an otherwise static slide and makes it more engaging in a subliminal way. The transitions throughout the slideshow are designed to be interesting and professional. They were also set up to reflect the speaker's presentation style. This slideshow is designed to showcase other transition possibilities. Please note the slowly rotating globe on the cover slide. Other transitions shown are more whimsical and demonstrate the animation possibilites in Powerpoint. This is a basic slide show used by the firm. It fulfills the need to be engaging without drawing unnecessary attention to slide animations. For better or worse, PowerPoint has become print layout software of choice for many companies. Quite often, templates are created for documents that are only printed and never projected as a presentation. The following examples show my experience creating these types of templates. 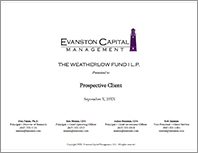 Evanston Capital Management, LLC is an alternative investment management firm focused on providing multi-manager hedge fund programs for institutional and high net worth investors. This is the presentation template I designed for ECM when they were going through a rebranding effort. Please note that this example has been intentionally “greeked” to protect the company’s proprietary message. It is included here to show the overall design and flow of the presentation. In addition to expanding the color palette for the book, I was also charged with solving an organizational problem. The company did not want to invest in separate tabs to be inserted into their books. To meet their objectives and still keep each book easy to maintain and organize, I created a “tab-less” system. Please note the left-hand margin of the presentation pages. Each is clearly labeled and helps walk the reader through the presentation. 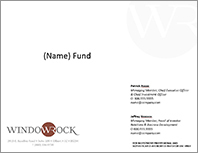 Window Rock Capital Partners was originally created to focus on investing in residential credit opportunities and to identify attractive investment opportunities in the residential real estate market. This is the presentation template I developed for the group. All text and data has been "greeked" to protect WR's proprietary message. It does, however, offer an overview of design layout. SunPower engaged me to create the content and the user experience flow for an online flowchart. This piece helps viewers to walk through a series of questions to determine whether or not their organization is a good candidate for commercial solar power. My years as a radio journalist have served me well in other positions. I have extensive experience writing, recording, and editing audio pieces. One of the many hats I wore during my tenure at Jellyvision was as Lead Media Producer. I would create and record sound effects and then match them to the animations in the computer trivia game series, You Don't Know Jack. One of the features of this interactive party game was the playing of spoof radio commercials that ran over the credits at the end of each game. This sample was written, recorded, edited, produced, and performed by me (I play the announcer).